Thank you for choosing to stay with us at Pettycur Bay Holiday Park. We hope that you enjoyed your holiday with us and we would love to welcome you back soon. At Pettycur Bay Holiday Park, we constantly work to improve the high standard of service we provide to our customers. We would really appreciate it if you could take a moment to send us your comments and feedback by completing the form on right hand side of this page. We would also love to hear any ideas or suggestions you may have on how we can make your future stay with us more enjoyable. If you feel that that there is anything which you would prefer to discuss with our management team over the telephone, please call us on 01592 892 200. Send us your comments and enter our Prize Draw! 1st prize: One week holiday for two people in one of our fabulous 5 Star Caravans at Pettycur Bay. 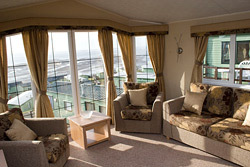 2nd prize: A weekend break for two people in one of our fabulous 5 Star Caravans at Pettycur Bay. 3rd prize: Dinner for two in our Horizons Restaurant. Winners will be notified in advance and asked to confirm dates for their prize holiday or dinner. Please note that we cannot guarantee availability during peak season times (July & August). 1st & 2nd Prizes include unlimited use of the facilities at our leisure centre. Sorry, your first name contained characters that are not allowed. Sorry, your last name contained characters that are not allowed. Sorry, this is an invalid email address. How would you rate our holiday park? Please let us know what you liked or disliked about your holiday at Pettycur Bay. Show my name and comments on the website. We would like to display your comments to our other visitors. All comments are reviewed by our staff before being posted on the website. Email addresses will not be shown. If you do not want us to share your comments on our website, please untick this box. Please verify the numbers you see in this image.